Below are the best St. Petersburg Florida hotels and resorts you will have when you visit this great area of Florida. Many of the hotels are situated in renovated historic buildings that add charm to your stay. When you are seeking a bay view then try the Hilton St. Petersburg Bayfront and you will find luxury at the Vinoy Renaissance St. Petersburg Resort and Golf Club which even has a 76 boat marina. 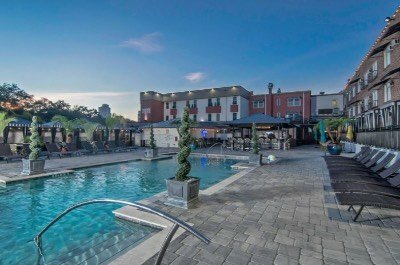 Properties in downtown include several boutique hotels which are the Hollander Hotel, the Hotel Indigo St. Petersburg Downtown North, the Inn on Third and the Ponce De Leon. The Courtyard St. Petersburg is a renovated historic building and the Hampton Inn St. Petersburg is a value oriented hotel. A superb choice for families is the Staybridge Suites St. Petersburg Downtown which boasts kitchens. No matter what you are searching for in accommodations you find something to please you. If you are seeking a chic mid-range boutique St. Petersburg Florida hotel that is perfect for all types of travelers that sports Old Florida charm then the Hollander Hotel is a superb choice for you. 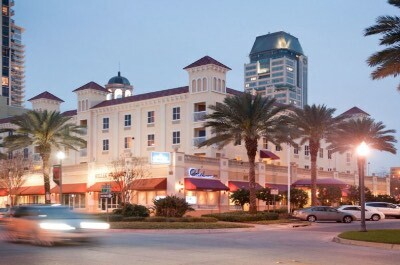 Situated in downtown 5-blocks from the Tampa Bay waterfront, the Hollander Hotel boasts nice amenities as well as easy access to numerous outstanding attractions such as the Chihuly Collection and the Morean Art Center. The Hollander Hotel is a 1933 building that boasts a colonial architectural design with 96 rooms and suites which sport a chic contemporary decor. Standard rooms are normal size with a choice of bedding, small kitchenette (microwave, refrigerator and coffeemaker) as well as boast city or pool views. Suites have an integrated living/space with a small kitchenette, a choice of bedding and views of the pool or city. The Hollander St. Petersburg Florida hotel has a perfect spot in downtown for you to start you explorations with the Sunken Gardens, Great Explorations Children’s Museum within a 15-minute walk and the Florida Holocaust Museum as well as the Museum of Fine Art is even closer. The hotel offers a free shuttle service to various locations within the downtown area. The Hollander St. Petersburg Florida hotel is close to the BayWalk where you will find shopping as well as entertainment and the white sands of St. Pete Beach are only a 25-minute drive away. The hotel features a stunning freshwater swimming pool with a fantastic sundeck which has been recently upgraded and there is food as well as drink service at HH20. There is not a fitness center onsite but there are daily yoga classes on the sundeck and there is a full service spa. Dining onsite includes all three meals at the Tap Room Restaurant and poolside service for lunch as well as drinks at night at HH20. Other options located offsite within walking distance include the Fourth Street Shrimp Store, the Parkshore Grill and the Mill. Nightlife is fascinating nearby with a trip to the Florida Orchestra for live music, watching the sunset at the Canopy Rooftop Lounge or you can catch a theatrical performance at the American Stage Theatre Company. When you are looking for a family friendly mid-range St. Petersburg Florida hotel that boasts tremendous access to several of the areas great attractions then stay at the Hampton Inn and Suites St. Petersburg Downtown. 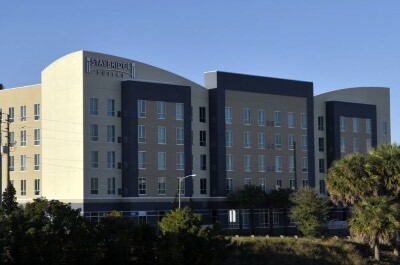 Situated just blocks from the waterfront of Tampa Bay in downtown, the Hampton Inn and Suites St. Petersburg Downtown is located within walking distance to the Museum of Fine Arts and Pioneer Park. The Hampton Inn and Suites St. Petersburg Downtown has a four story Mediterranean architectural style with 91 rooms and suites which sport a contemporary decor. Guest rooms are sized at 275 square feet with a choice of bedding and offers views of the surrounding city. Studios suites range in size from 400 to 525 square feet with a choice of bedding, small kitchenette and integrated living/sleeping space. Studios are also available with or without a balcony which features views of the city. The Hampton Inn and Suites St. Petersburg Florida hotel has great access to some of the top attractions in downtown including the Salvador Dali Museum, shopping at Sundial St. Pete and Outdoor activities include a walk through Demens Landing Park, South Straub Park and historic St. Pete Beach where you will find gorgeous white sand is only a 25-minute drive away. The Hampton Inn and Suites St. Petersburg Florida hotel has a nice freshwater swimming pool with a sundeck that overlooks the city as well as a fitness center onsite. You will be pleased with the complimentary breakfast served daily but there is no restaurant onsite. Dining options within an easy walking distance include BellaBrava for Italian, Cassis American Brasserie serves French cuisine and Ceviche St. Petersburg prepares Latin specialties. Nightlife is abundant in the area with Alvin’s for live music, catch a movie at Muvico Sundial 19+IMAX or just walk along the BayWalk at sunset. The Vinoy Renaissance St. Petersburg Resort and Golf Club is a spectacular luxury St. Petersburg Florida hotel that is perfect for all types of travelers who are seeking plenty of onsite amenities. Situated in historic downtown directly on Tampa Bay, the Vinoy Renaissance St. Petersburg Resort and Golf Club has a great location to such stellar attractions as the Chihuly Collection and Vinoy Park. 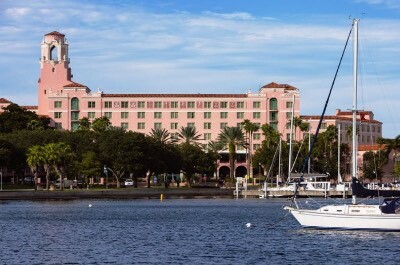 The Vinoy Renaissance St. Petersburg Florida hotel and Golf Club is a historic 1925 Mediterranean Revival architectural style high rise building with 361 rooms and suites that sport a newly renovated contemporary decor. The historical portion of the hotel has guest rooms that are sized at 330 square feet with a choice of bedding and some of these rooms are furnished with a balcony that which feature views of the gardens or Tampa Bay. The newer rooms in the Tower portion are sized from 330 to 405 square feet with a choice of bedding and a private balcony that boasts views of the garden or bay. Patio Spa rooms are 405 square feet with a private spa on the patio that overlooks the gardens. One-bedroom Executive king suites have 475 square feet with a separate living room and private balcony that sports views of the bay. Chairman suites are located in the historic building and have one-bedroom, a choice of bedding, a separate living room, 2-bathrooms as well as a balcony with views of the gardens. The Vinoy Renaissance St. Petersburg Resort and Golf Club also has a 74 boat slip to accommodate water travelers. Nearby attractions within walking distance to the property include the Museum of Fine Arts, the St. Petersburg Museum of History and you can even take a historic tour of the hotel. Outdoor activities can be found at North as well as South Straub Park and the hotel has a complimentary shuttle to transport you to the white sands of St. Pete Beach. If you are a golfer you will be pleased with the Renaissance Vinoy Golf Club which is onsite. The Vinoy Renaissance St. Petersburg Florida hotel and Golf Club has a freshwater swimming pool within a beautiful garden setting, a fitness center, tennis courts, golf course, marina and a full service spa. Dining at the property includes Marchand’s Bar and Grill as well as the Clubhouse Restaurant for all three meals; the Veranda Cafe serves breakfast and lunch; Alfresco’s prepares lunch as well as dinner and Fred’s Cellar boast dinner service only. Nightlife includes live music on selected nights in the Lobby and Veranda Bars and offsite you can enjoy a cold beverage at the Ale and the Witch or a show at the American Stage Theatre Company. If you are seeking a mid-range waterfront St. Petersburg Florida hotel that is perfect for all types of travelers then the Hilton St. Petersburg Bayfront is an ideal selection. Situated along the Tampa Bay in historic downtown, the Hilton St. Petersburg Bayfront is an easy walk to many fascinating attractions like the Museum of Fine Arts and the BayWalk. The Hilton St. Petersburg Bayfront has a modern high rise architectural style with 333 rooms and suites that offer a contemporary decor. Guest rooms are normal size with a choice of bedding options and views of the surrounding area. Deluxe rooms are sized similar and are located on higher floors to boast better views of the area. One-bedroom suites are ample in size with a separate living room and some units have corner views. The Hilton St. Petersburg Bayfront hotel has a superb place within downtown for you to plan your adventures of the area. You are within walking distance to the Salvador Dali Museum, the Chihuly Collection and the Morean Art Center. Outdoor activities include a walk in Demens Landing Park or Pioneer Park and you are a short drive to the white sand of Fort De Soto Park. The Hilton St. Petersburg Bayfront has a gorgeous freshwater swimming pool with a sundeck that features couches as well as fire pits and there is a fitness center onsite. Dining options onsite includes Tangerine which serves all three meals and CP Express has grab-n-go food. Offsite dining options are numerous within walking distance with Gratzzi Italian Grille, the Red Mesa Cantina serves Mexican dishes and the Mill prepares American cuisine. Nightlife is easy to find with the Mahaffey Theater for a live performance, Ruby’s Elixir has live music or have a quiet drink from the onsite Dali Bar around the fire pits on the sundeck. When you are searching for a value oriented St. Petersburg Florida hotel that is close to many of the outstanding attractions then the Hampton Inn St. Petersburg is a perfect selection. Situated northwest of historic downtown in a quiet neighborhood, the Hampton Inn St. Petersburg allows for easy access to the St. Petersburg/Clearwater Airport, downtown attractions such as the Salvador Dali Museum and Tropicana Field. The Hampton Inn St. Petersburg has a modern four story architectural design with 130 rooms and suites that have a modern decor. Guest rooms are sized at 350 square feet with a choice of bedding and some rooms are available with a small kitchenette. One-bedroom suites have 600 square feet with a separate living room and small kitchenette. All rooms have a view of the pool or surrounding neighborhood. The Hampton Inn St. Petersburg is a place perfect for you to start and end your day of exploring all the fantastic attractions like the Sunken Gardens, Gizella Kopsick Arboretum, the Great Explorations Children’s Museum and Florida Holocaust Museum are all within a 3-mile radius. You have easy access and only a 25-minute drive to white sands at Treasure Island Beach. 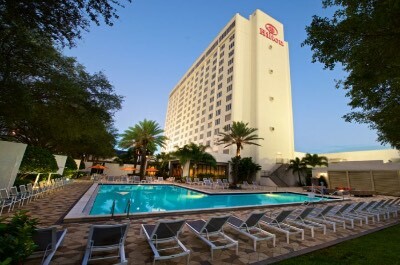 The Hampton Inn St. Petersburg Florida hotel has a freshwater swimming pool with a sundeck and a fitness center. You will be able to indulge in complimentary breakfast daily and offsite dining selections within an easy walk are Mazzaro’s Italian Market, PoFolks serves great fried catfish and chicken as well as Kissin’ Cuzzins Neighborhood prepares American dishes. Nightlife is an easy walk with the Freefall Theatre Company, 3 Daughters Brewing or a game of billiards at Bula Kafe all within a half-mile. The Inn on Third is a fabulous mid-range boutique St. Petersburg Florida hotel which is ideal for couples that are looking for charm and close proximity to the exciting downtown area attractions. 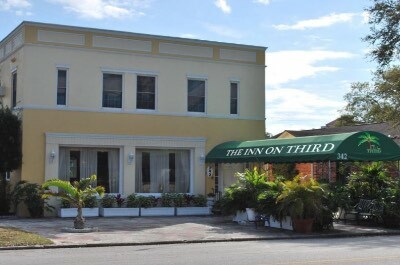 Situated in the heart of downtown, the Inn on Third has a great location with the Museum of Fine Arts and Vinoy Park just minutes away by foot. The Inn on Third is a historic building that was constructed in the 1920s in a two story four square architectural style and contains 20 rooms which boast a Victorian decor. Rooms are not large but very comfortable with a choice of bedding and each room sports different Victorian touches as well as views of the surrounding neighborhood. The Inn on Third St. Petersburg Florida hotel is a great place to start your explorations of the many superb attractions that are within walking distance like the Sunken Gardens, Salvador Dali Museum and the Pier as well as Sundial St. Pete for numerous shopping venues. Outdoor activities nearby include the BayWalk or take a stroll through historic downtown St. Petersburg as well as a free trolley stop right in front and its only 25-minutes to Sunset Beach. There is not a freshwater swimming pool or fitness center onsite. There is an excellent complimentary breakfast served daily with offsite dining options within a short walk that include BellaBrava for Italian, the Annata Wine Bar serves Mediterranean specialties and Stillwaters Tavern prepares American style cuisine. You have many choices for nightlife within walking distance that includes a theatrical performance at the American Stage Theatre Company, Five Bucks Drinkery has a lively atmosphere and 260First is a fun pub. The Staybridge Suites St. Petersburg Downtown is an ideal mid-range St. Petersburg Florida hotel for families that want to be close to downtown with easy access to many of the outstanding beaches of the area. Situated near Tropicana Field just off of I-175, the Staybridge Suites St. Petersburg Downtown is located within an easy drive to the many attractions located in the downtown area. The Staybridge Suites St. Petersburg Downtown has a modern five story architectural design with 119 suites which have a modern decor. Studio suites range in size from 415 to 515 square feet with a choice of bedding, a full kitchen, an integrated living space and views of the area from large windows. Suites are sized at 590 square feet with a separate living room, full kitchen and views of the surrounding area. The Staybridge Suites St. Petersburg Florida hotel has an ideal spot if you are attending a baseball game at Tropicana Field and the hotel offers free shuttle service to as well as from the ball park. While staying at the Staybridge Suites St. Petersburg Downtown you are within walking distance to the Ted Williams Museum and Hitters Hall of Fame, the Florida Holocaust Museum as well as the Morean Art Center From the hotel you have an easy drive to the superb sites of the downtown area including the Sunken Gardens, Museum of Fine Arts and the Chihuly Collection. Outdoor fun is also a short drive to Demens Landing Park and St. Pete as well as Pass-A-Grille Beaches are within 25-minute. 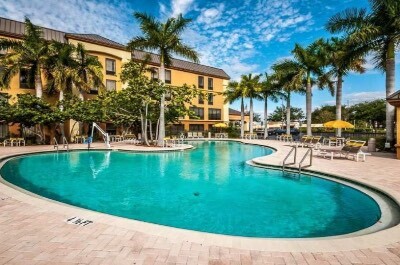 Staybridge Suites St. Petersburg Florida hotel has a freshwater swimming pool and a fitness center onsite. You will enjoy a complimentary breakfast daily and there is an evening reception Monday through Wednesday during happy hour. There is no restaurant onsite and offsite dining options within a short walk include Bodega Comida Cantina Cafe for Latin, Engine No. 9 prepares pub fare and Hawkers Asian Street Fare. Nightlife within an easy walk includes a baseball game at Tropicana Field, a cold beverage at the Green Bench Brewing Company, a challenging game at Escape St. Pete LLC or maybe you can catch a concert at the State Theatre. If you are seeking a mid-range historic boutique St. Petersburg Florida hotel that is just steps from the waterfront and many of the city’s outstanding attractions then you need to stay at the Ponce De Leon Boutique Hotel. Situated in downtown only 2-blocks from the Tampa Bay waterfront, the Ponce De Leon Boutique Hotel is located just minutes from attractions like the Museum of Fine Arts, Vinoy Park and Sundial St. Pete. 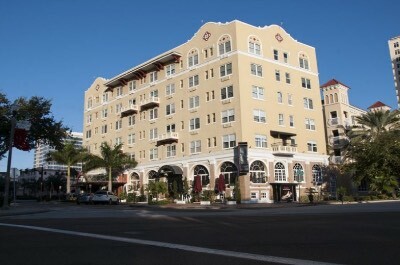 The Ponce De Leon Boutique St. Petersburg Florida hotel was originally constructed in the 1922 with a slight Art Deco six story architectural style which now contains 74 rooms and suites that have a fresh chic decor. Guest rooms range in size from 150 to 215 to 250 square feet with a choice of bedding and city views. Deluxe rooms are slightly larger with superb views of the surrounding area. Suites have more living space with a sofa sleeper and great views of the surrounding area. The Ponce De Leon Boutique Hotel is only steps away from the Salvador Dali Museum, the Baywalk and the St. Petersburg Museum of History. Outdoor fun can be found within walking distance at Pioneer Park as well as North Straub Park and you can take a short 25-minute drive to Sunset Beach or St. Pete Beaches. The hotel does not have a freshwater swimming pool or fitness center onsite. Dining at the Ponce De Leon includes several restaurants on the ground floor overlooking the street which include Ceviche St. Petersburg for Latin and Courigan’s Irish Pub. Other dining options within a short walk are Gratzzi Italian Grille, Moon Under Water serves Indian cuisine and the Mill prepares American dishes. Nightlife is lively within walking distance with the Mahaffey Theatre for a show, a glass of wine at Wine Madonna and the Canopy Rooftop Lounge has spectacular sunsets. When you are seeking spacious accommodations in a historic mid-range St. Petersburg Florida hotel that has great access to many of the exciting attractions of the city, then you should stay at the Courtyard St. Petersburg Downtown. Situated in downtown just minutes from the waterfront, the Courtyard St. Petersburg Downtown is centrally located with easy walking access to several top attractions like the Morean Art Center and the Florida Holocaust Museum. The Courtyard St. Petersburg Florida hotel is a renovated 1925 historic hotel with a high rise architectural style that is highlighted by original accents such as a marble staircase and contains 128 rooms as well as suites that sport a fresh contemporary decor. Guest rooms have plenty of living space with a choice of bedding, small kitchenette and views of the neighborhood. Larger king rooms with a sleeper sofa have a small kitchenette and similar views of the city. One-bedroom suites have a separate living room, small kitchenette and views of the city. The Courtyard St. Petersburg Downtown has a great spot to explore the city’s many attractions by foot which includes a 15-minute walk to the Sunken Gardens, the Pier and the Museum of Fine Arts is even closer. The hotel has a complimentary shuttle service for a 2-mile radius. Outdoor activities can be found at Vinoy Park on the waterfront and it’s a 25-minute drive to Sunset as well as Treasure Island Beaches. The Courtyard St. Petersburg Florida hotel has an indoor freshwater swimming pool as well as a fitness center onsite. Dining onsite includes the Bistro which is open for breakfast and dinner. Offsite dining options within walking distance include La V for Vietnamese, Red Mesa Cantina prepares Latin and Mexican cuisine as well as Cassis American Brasserie serves French dishes. Nightlife within walking distance includes Ruby’s Elixir for live music, a cold craft beer at Cycle Brewery or a live performance by the Florida Orchestra. 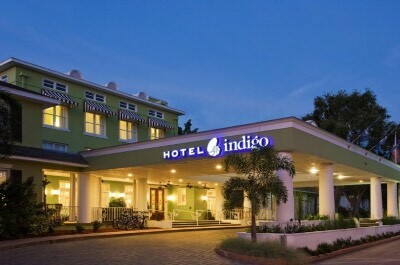 If you want to stay in a mid-range boutique St. Petersburg Florida hotel which is adults-only and sports incredible charm, then the Hotel Indigo St. Petersburg Downtown North is the perfect choice for you. Situated in downtown St. Petersburg just a few blocks from the Tampa Bay waterfront, the Hotel Indigo St. Petersburg Downtown North is within walking distance to many of the top attractions in the city like the Baywalk and the Museum of Fine Arts. 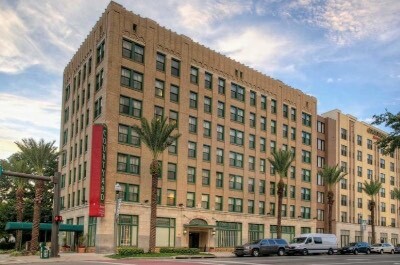 The Hotel Indigo St. Petersburg Downtown North was originally constructed in 1926 as a private residence and sports a four-square architectural design which has original stained glass accents with 76 rooms as well as suites that boast a chic retro decor. Standard rooms have a choice of bedding and nice views of the neighborhood from large windows. Suites have more living space with integrated living/sleeping area with an additional sofa sleeper as well as views of the neighborhood from large windows. The Hotel Indigo St. Petersburg Downtown North has a perfect spot for exploring the sites of St. Petersburg on foot with attractions such as the Salvador Dali Museum, the Chihuly Collection and the Florida Holocaust Museum. When you want to visit the beach, you are only a short drive away from St. Pete Beach. The Indigo St. Petersburg Florida hotel has a freshwater swimming pool with a sundeck as well as a small fitness center onsite. You can indulge in a complimentary breakfast daily and the Heritage Bar and Grill serves all three meals as well as Phi Cafe prepares breakfast and dinner. Offsite dining options that are within walking distance include BellaBrava for Italian, the Parkshore Grill prepares contemporary American cuisine as well as the Mill. Nightlife is abundant and on foot you can walk to the American Stage Theatre Company for theatrical performances, the Ale and Witch for a cold beverage as well as live music at Alvin’s.